Wage-theft cases are routine for Liss-Riordan. In 2015, she convinced a federal appeals court that Dunkin’ Donuts managers could prove that they’re eligible for overtime if their duties aren’t primarily managerial. The Ocean State Job Lot case ended in a second mistrial; afterward, the jurors told her that one holdout juror refused to side with the workers. Liss-Riordan settled the case on behalf of 300 assistant managers. Fast-food and retail managers “are making pretty low wages, but because they’re on salary, the company can work them as many hours as they want,” she says during an interview at the Boston office of Lichten & Liss-Riordan, P.C., the plaintiffs’ employment-law practice she co-founded in 2009. Since then, she has successfully sued national corporate giants like Starbucks and Marriott, as well as local and regional companies: she’s taken on “just about all the strip clubs in Massachusetts,” for defining exotic dancers as independent contractors, rather than employees, as if they were running their own businesses. She has also sued the Harvard Club of Boston and the Harvard Faculty Club for withholding tip payments from wait staff, arguing that the tips had to be disbursed to employees under state law. (Both cases were settled.) Currently, she’s representing a massage therapist at the University’s Center for Wellness, who she believes is misclassified as an independent contractor. During a period of severe income inequality and increased participation in a so-called sharing economy that lacks traditional job benefits or protections, her efforts to clarify and expand the rights of workers have gained her a public profile. Through her 2013 suit against the ride-sharing company Uber, the highest valued start-up in the world, she’s helped shape the debate over whether the sharing economy benefits workers by giving them maximum flexibility, or leaves them vulnerable to the vagaries of the market. One of her favorite cases involved Coverall, a national cleaning company. “There’s a whole host of these cleaning companies,” she explains, “that ‘sell’ cleaning jobs to workers, who are most often immigrant workers, who…pay thousands of dollars for these cleaning jobs. The companies try to get away with it by calling them ‘franchises.’…[The workers are] really paying for the right to scrub toilets in office buildings. It’s heartbreaking.” The Massachusetts Supreme Judicial Court agreed with Liss-Riordan that it was illegal to make someone pay to work. The resulting settlement yielded payments to several hundred workers, transferred the cleaning accounts to them, and, most important, forced Coverall to stop operating in Massachusetts. In her Uber suit, Liss-Riordan argued that the company had misclassified its drivers as independent contractors, making them responsible for their own business expenses, like gas and car maintenance, and ineligible for protections like a minimum wage or healthcare. But first, she had to get past Uber’s own arbitration clause, persuading California federal judge Edward Chen to rule in June 2015 that the clause was unenforceable. That cleared the way for Chen to certify a class of nearly 240,000 Uber drivers—the majority of the company’s drivers in California. Then, Liss-Riordan decided against going to trial, instead negotiating a massive settlement of $84 million, or $100 million if the company ever went public, on behalf of 325,000 Uber drivers in California and another 60,000 in Massachusetts. The central question of whether Uber drivers were rightfully employees or freelancers remained unanswered. What Silicon Valley libertarians view as a revolution in work—workers get to be their own micro-entrepreneurs, without any of the hassle of employment—Liss-Riordan views as a scam to steal wages. Uber argues that it lets drivers set their own schedules, she says, but a lot of workers get to choose their hours—that doesn’t mean they aren’t employees. Uber also sets drivers’ rates and performance standards, and relies on their labor for its income—all qualities of a managed labor force. After the Uber deal, Liss-Riordan faced public scorn from some of the drivers covered by the settlement, and from onlooking lawyers, who called it a cash-grab that sold out the interests of workers. Liss-Riordan responded by cutting her firm’s share of the settlement by about half, to $10 million. Asked about the allegations, she says: “The $100 million number was so big it just encouraged a bunch of lawyers who wanted to get a piece of the action to jump on it and try to scuttle it.” She skates over the suggestion that there’s a trade-off between settling and seeing the case through to trial: “Getting a fair settlement puts money in people’s pockets now, without having to worry about who’s going to be the next appointee to the Supreme Court.” Ultimately, Liss-Riordan chose to settle because she wasn’t sure she could win a trial, and she says it was a “monumental effort” just to get Uber’s arbitration clause dismissed. The settlement, however, was rejected last August by Chen, who argued it wasn’t “fair, adequate, and reasonable.” And then, in a separate decision, the Ninth Circuit Court of Appeals reversed Chen’s earlier ruling that Uber’s arbitration clause was unenforceable. Chen’s rejection marked a big loss for Liss-Riordan, tactically and financially. She still hopes to convince the courts that arbitration clauses violate the National Labor Relations Act and says, if pressed, that she is prepared to file thousands of arbitration claims on behalf of Uber drivers. “What’s going to happen now in this case is really uncertain,” she says. “Whether we’ll be able to hold together that class and see anything like $100 million again is a big question mark.” The dollar figure represented almost as much money as she’d negotiated in all of the settlements throughout her career. And the opprobrium cast by her critics struck a nerve for Liss-Riordan, who views herself as a lifelong advocate for workers. As an undergraduate, she studied psychology and was interested in issues involving women in science; she was drawn to labor law only after college, while working on women’s-rights organizing with former U.S. representative Bella Abzug, a New York Democrat who was also a labor lawyer. In 1991, when Anita Hill testified that Clarence Thomas, then in confirmation hearings for the U.S. Supreme Court, had sexually harassed her, Liss-Riordan watched the women of her generation become galvanized by issues of gender in the workplace. By the time she entered Harvard Law School (HLS) a few years later, she says, she knew she wanted to use law as a tool to advance social justice. “I spent a lot of my time in law school being one of those public-interest-activist types,” she remembers. In April 1995, in her regular, punchy column in the Harvard Law Record, she urged HLS to devote more funds to its low-income protection plan (LIPP), a loan-forgiveness program for students working in public-interest law: “LIPP should not just make possible low-paying work for students committed to public interest; it should encourage that route for those who have not made up their minds.” She also poked fun at the view held by her peers that they needed to gain experience at a corporate-law firm: that’s “by no means a mandatory stage in a lawyer’s career.” Her own trajectory makes the point: the first time she set foot in a corporate firm, she jokes, was as a “practicing lawyer to take a deposition”—although more than once she’s faced off against fellow alumni who were representing corporations in court. 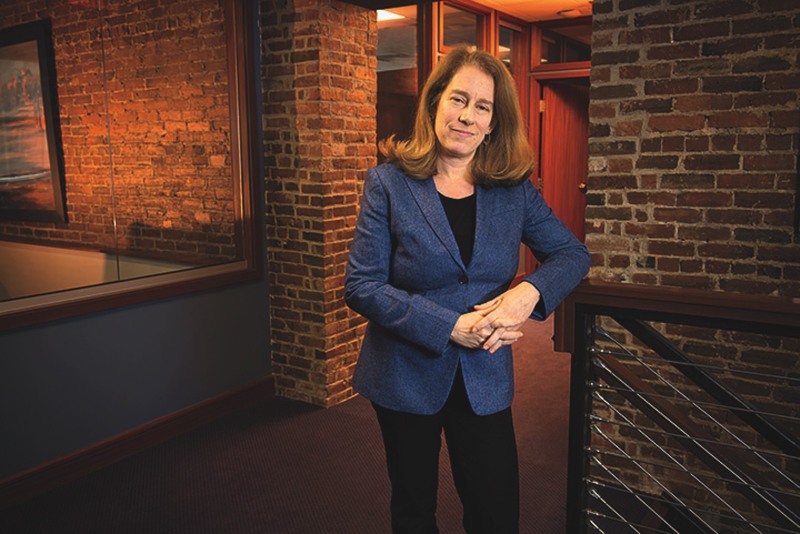 Liss-Riordan distinguished herself early, with high-profile victories in employment discrimination cases, and in 2002 was named a “lawyer of the year” by Massachusetts Lawyers Weekly. She and Lichten got along so well, they opened their own practice (it now employs nine other attorneys) and recently added a second office in San Francisco, the better to take on the app economy. On that front, despite losing the Uber settlement, Liss-Riordan doesn’t sound discouraged. A $27-million settlement from a similar lawsuit she brought against Lyft, another ride-sharing company, is nearing approval. Meanwhile, she is pursuing a federal complaint alleging that Uber’s star-rating system for drivers is racially biased. In order to be protected from discrimination under the Civil Rights Act, the drivers need to be employees (not contractors); Liss-Riordan hopes the Equal Employment Opportunity Commission will determine that’s what they are.